Share with your friends and see if they can accept the dare ! 🔴Red :- mujhe abhi msg ya call krke i love u bolo ! 🕡White :- Meri koi khami btao ? ⚫Black :- Meri tarif me 3 word bolo ! 🚸Yellow :- Zindgi ka sbse yaadgar din btao ? ✳Green :- Mjhe chocolate do ! 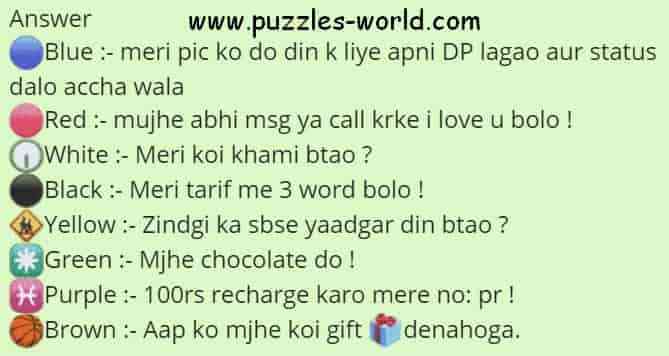 ♓Purple :- 100rs recharge karo mere no: pr ! 🏀Brown :- Aap ko mjhe koi gift 🎁 denahoga.